My name is Buck. 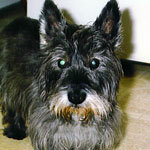 I am a cairn terrier. I saw one just like me in a movie once. I don’t remember the name of the movie, but there was a lion, and a scarecrow, and a tin man, and a scary witch! But the little cairn, Toto, saved the day. I grew up in a house in Connecticut with two wonderful people, Nick and Sally. They took very good care of me, and I looked after them too. I had a big lawn to play on, and Nick and Sally took me on trips with them. A couple of times, we went to something called a dog show. They walked me around a ring. Everyone seemed to like me; they clapped and cheered. My heart swelled with pride. Nick and Sally got very excited over something called ribbons. They called me their champion. I don’t know what that is, but the way they said it made me feel good. Things went on like this for a long, long time. Playing ball, chasing squirrels, life was good. Nick and Sally did have a little boy named Bill, who was mean to me sometimes, but he eventually grew up and went away to a place called college, and he never came back. I could have gone on like that forever. But after many years, I noticed that Nick and Sally seemed to be slowing down. Our walks got shorter, and they couldn’t chase the ball with me any more. To tell you the truth, I was starting to feel a little tired myself. Then one day, a terrible thing happened. I heard one of those cars with flashing lights and a very loud siren off in the distance. It kept coming closer and closer. It stopped at our house! No matter how hard I barked, it wouldn’t go away. I couldn’t believe what happened next. Nick got in this car, and it took him away. I waited many, many days, but Nick never came back. My heart was broken. Sally seemed very sad too. I tried to cheer her up, but it was hard because I was so sad myself. We both just got sadder and sadder, until one day, one of those cars came and took Sally away too. This time, I knew she wouldn’t be coming home either. What happened next was the worst thing that has ever happened to me. I couldn’t believe who showed up at our house – Bill! He said I was coming to live with him! Oh no! I was so scared. Bill took me away from my house in Connecticut where I had had such happy times. He took me to a very small place called an apartment in a very big place called New York. It was horrible. It was noisy and it smelled awful. There was a place called a park, with grass just like my lawn in Connecticut, but Bill never took me there. Bill wasn’t very nice to me either. He would forget to take me out, and sometimes he would even forget to feed me! I could feel something stirring in my heart. I became more and more alert and waited for my chance. One day, Bill was careless, and out the door I went. I was free! But wait a minute. I was also scared. I couldn’t see or hear as well as I used to, and there were lots of cars. I could hear those awful ones with the sirens and flashing lights. I got so frightened that I started to run. I ran and ran until I couldn’t run anymore. I was about to give up when I heard voices. Was it Nick and Sally? No, it was a group of little boys! Oh no! Were they going to be mean to me like Bill was? They were coming toward me with a rope! I tried to run away, but they were faster than I was. I was so scared I tried to fight, but they tied some of the rope around my mouth. They tied the rest of it around my neck and to a little fence. Wait a minute! They were being nice to me. They talked to me very quietly, and once I calmed down, they petted me and scratched me behind the ears. One of them went to get me some water, and one of them went to get Nina, the dog lady. I was still very scared, but I was starting to think that maybe things were going to be okay. Nina cried when she saw me. I guess I was a bit of a mess. But she told me I was rescued and took me to the doctor. I was so dirty that they had to give me five baths, but it made me feel so much better that I didn’t even mind. They also cleaned my ears and my teeth and gave me medicine for my ears. I started to feel a little better. Then I got another nice surprise. Nina came and took me home. She told me it was a foster home, so I couldn’t stay there forever, but she said they would find a good home for me. She had found Bill, who told her I was seventeen years old. Bill said he didn’t want me anymore. That was alright, because Nina wouldn’t have given me back anyway. I think Nina was a little worried that no one would want me because I was so old. But I wasn’t worried. If I looked out the window of Nina’s apartment, I could see a big painting on the wall across the street. It was a painting of all sorts of birds, just like the ones they have in Connecticut, and at the top of the painting, it said “Katie’s Place.” I knew that was where I was going. And sure enough, one day, Nina told me that Katie was coming to get me. She seemed so excited and surprised, but I could have told her she was coming. I knew that she got lost four times, but I knew that each time, people helped her find her way: a man with a fishing pole, a troop of Boy Scouts, a hot dog vendor, and a man eating an ice cream cone. I could tell when she drove down our street and found a parking space right in front of our building. I know she smiled when she saw the birds and Katie’s Place. I could hear Katie coming up the stairs and in the door. Here she was! Katie crouched down. I ran over to her and tucked my head under her knee. She put her hand on my shoulder, and we stayed like that for a long, long time. Then she picked me up and held me. I sighed and felt so relaxed. Then it was time to go. Nina walked us out to the car and said goodbye, and then we drove for a long, long time. The farther north we got, the more familiar things became. The air started smelling very clean and sweet. Finally, we turned off the highway onto a quiet little street. I saw lawns and white picket fences. And there was a block party! Katie said it was for a lady named Arlene, but I knew it was just for me. I just couldn’t believe my luck. Katie had a big yard, and the grass felt so good under my feet. And Katie had another dog just like me! His name was Cubby. Cubby was a youngster. Sometimes he would try to get me to play when I was too tired, but he also looked after me. Katie and Cubby took very good care of me with lots of love and plenty to eat. Katie also took me on lots of adventures. We spent Thanksgiving at the beach at Plum Island. We went to Washington, DC, to celebrate the millennium, and I got to drink something very fancy called Evian Water. But the best adventure of all was a trip we took to a dog show in Pennsylvania. “Montgomery,” it was called. People were very interested to see such an old dog that had been rescued. And there was a surprise in store. The morning after we got there, Katie got me all fixed up and took me downstairs. I couldn’t believe my eyes. They were going to let me march around the ring all by myself! There were over a hundred people there, all waiting to see me. Katie couldn’t believe it when I stepped into the ring. The years stripped away and I strutted around like a young dog. Katie didn’t know I had done this before. People were crying, and my heart once again swelled with pride when I heard the applause. It was a shining moment I will never forget. It was a moment I dreamed of many times during the months I lived with Katie. Life was good again like it had been with Nick and Sally. It was a little colder in New Hampshire than it had been in Connecticut, but finally the days got warmer and the lilacs started to bloom.